“Rwanda has been one of the fastest growing economies in sub-Saharan Africa, and emerged as a global leader in promoting gender equality. Over the past ten years, economic growth has averaged 7.7 percent, with per capita income close to doubling to $729 in 2016. Between 2004 and 2014, the poverty rate declined by almost 18 percentage points to 39 percent while extreme poverty declined to 16 percent. 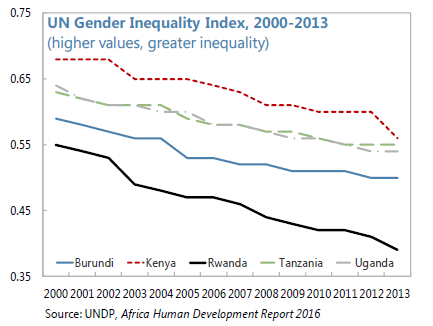 Rwanda’s advances in gender equality emerged, in part, as a necessary component of the rebuilding and development strategy from the mid-1990s, with women taking on new roles as major actors in society and heads of households. Today, the role of Rwandan Women is celebrated, as evident in many aspects elaborated further in this paper. Gender equality as an integral component of its development agenda—with advocacy at the highest level, constant engagement in programs to enhance economic opportunities for women, home-grown solutions to address gender inequality, an enabling legal framework and supporting institutions—such as a dedicated gender “machinery”: the Ministry of Gender and Family Promotion, the Gender Monitoring Office, the National Women Council, and the Forum for Women Parliamentarians. The provision of gender disaggregated data has increased (NISR 2016: National Gender Statistics Report), and allows a timely assessment of the main indicators.